Its misidentification in the Maidstone Museum in the UK, as 'EA 493—Mummified Hawk Ptolemaic Period', came to light in 2016 when the museum decided to CT-scan its resident female mummy and, incidentally, to scan 'EA 493' and other animal mummies at the same time. That's when the smaller mummy surprised experts, who identified it as a human fetus. 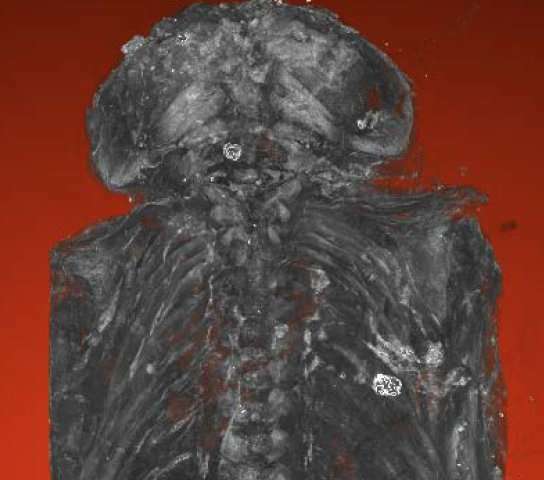 But the CT scans lacked detail and Nelson worked with the Museum and Nikon Metrology (UK) to conduct a micro-CT scan: an extremely high-resolution scan that didn't entail damaging the mummy in any way. The research provides important clues to the maternal diet—anencephaly can result from lack of folic acid, found in green vegetables—and raises new questions about whether mummification in this case took place because fetuses were believed to have some power as talismans, Nelson says. A team of more than a dozen researchers—specialists in Egyptology, radiology, anatomy, neonatology and urology, from Western University to England to France to Cairo—lent their expertise to the project.